If you are planning your Brazilian themed night look no further. 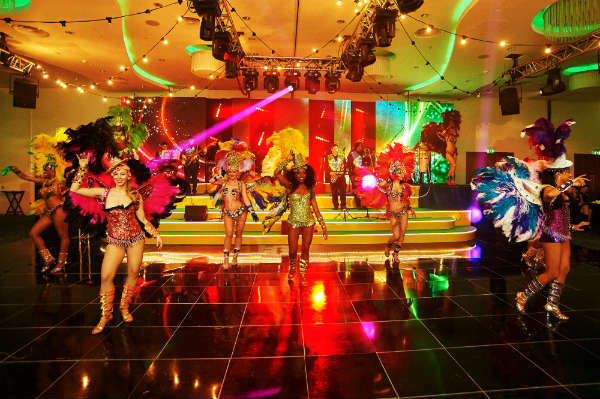 Tropicalia will bring the colours, rhythms and electric carnival atmosphere at your event! 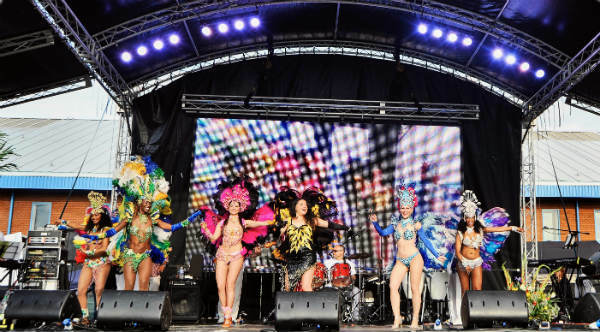 Since 2003 Tropicalia is the only ensemble in the UK providing the Best and Most unique Latin Brazilian Show Entertainment including live music, singing and dance with up to 20 or more Musicians, Singers, Dancers and Performers available to entertain you. Thanks to their accuracy in preparation, enthusiasm on stage and quality of entertainment, their reputation has grown significantly over the years. At present Tropicalia is the Capital’s leading show business dedicated to this kind of Entertainment supplying top class agencies, blue chip companies as well as promoters throughout the UK and abroad. Their Awarded Latin Brazilian stage production features an established exceptional live Band, a female Brazilian vocalist/dancer singing comfortably in Portuguese, Spanish and English, fascinating and dynamic Dancers performing traditional Latin and Brazilian dance choreography with a contemporary flare brought on stage with elegance and professionalism. 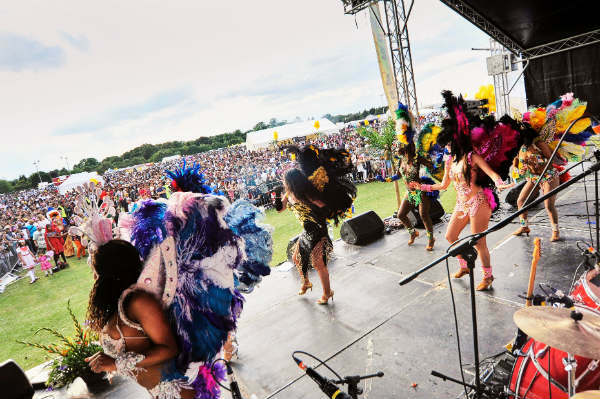 This spectacular Show will definitely bring the WOW factor at your event featuring a display of beautiful original carnival costumes and colourful feathers as well as shiny sequined dresses throughout. 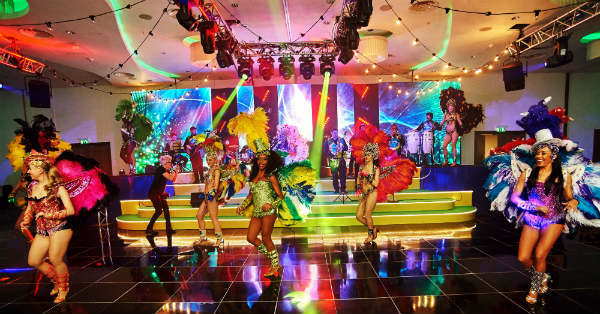 A visual astonishing show presentation celebrating Latin American music and dance to such mesmerizing effect that the audience are given a taste of what the Rio de Janeiro Carnival or Havana de Cuba club scene has to offer. As all of their shows this performance also includes an element of audience participation encouraging audience members to join the performers on the dance floor. 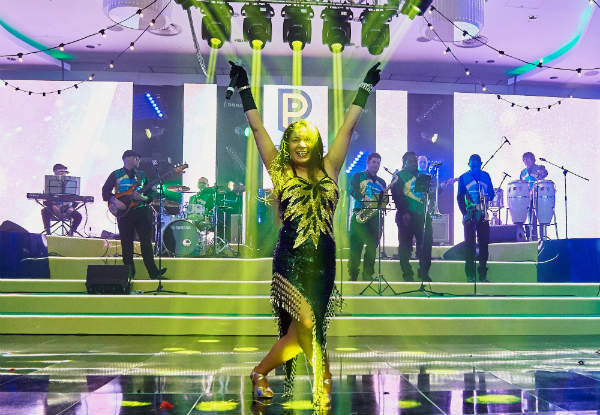 The Band is very versatile and can please any audience with a wide repertoire covering not only Latin and Brazilian songs but also well-known Latin pop, Classic 70’ and top charts to dance the night away! 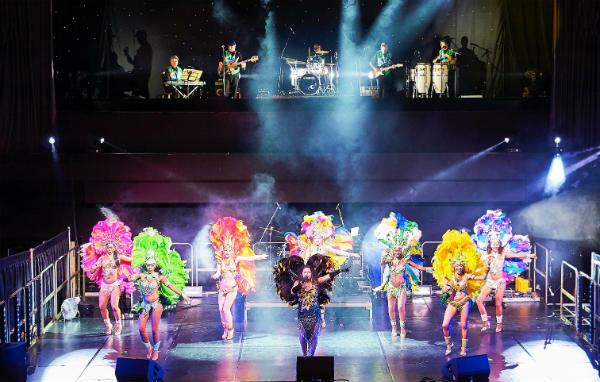 Tropicalia can also scale down the line-up and present their show with only dancers and singer performing to backing tracks or supported by live samba drummers. This can be a valid alternative for small events or simply for lack of space or tight schedule. 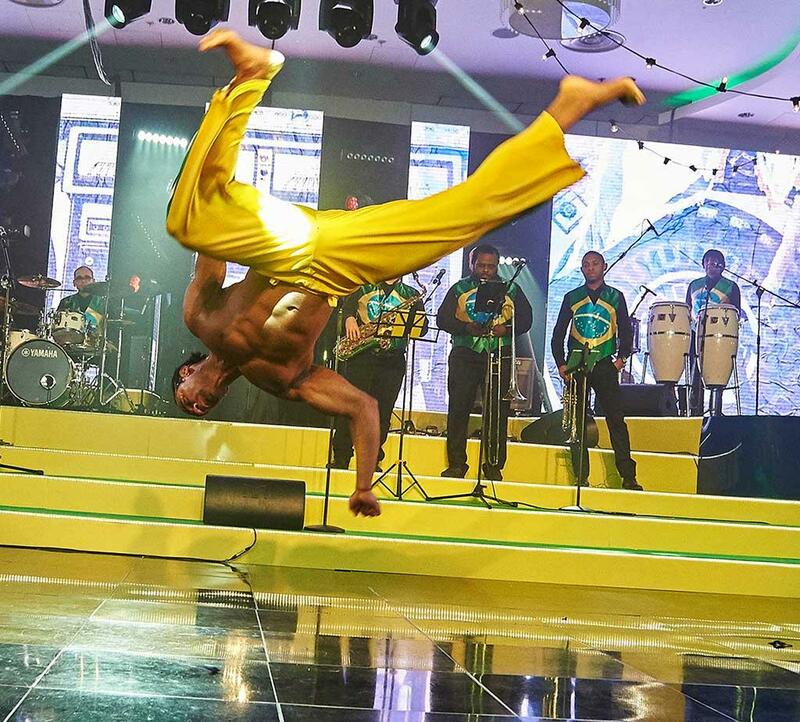 This stunning act is also perfect as corporate entertainment. 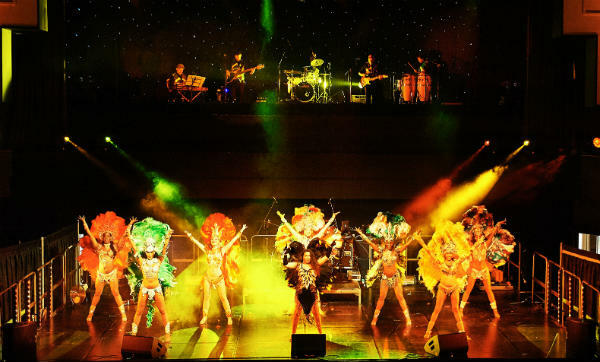 Tropicalia Latin Brazilian Show is a Multi Award Winning vibrant London based established company wholly run by professional artists with International experience. They are the only Latin Brazilian Ensemble in the UKto have won 3 LUKAS – The First and only recognized Award by public vote for Latino Culture in the UK. Since 2003 Tropicalia has provided the Best and Most unique Latin Brazilian Show Entertainment including live music, singing and dance with up to 20 or more Musicians, Dancers and performers available. They have vast experience, working in the entertainment industry for over 15 years internationally. “We wanted to create a fresh and innovative performance and blow some new life into the traditional entertainment scene.We believed that our different artistic experiences could produce something with the potential of breaking the Latin/Brazilian entertainment market and so far so good”. “All of our musicians and dancers are qualified and professionally trained. We are a full time working Show band pretty much involved in any aspect of our profession: touring, session and recording studio, musicians ,dancers and workshop classes, touring Productions etc”. “Being working with Contraband for 10 years it is almost impossible to recall all the events we have performed at. However, if we have to pick one, we would say the Starbucks Event at the Barbican and Brewery”. “Receiving applause and compliments by members of the audience is always very rewarding because it means that you have delivered a good job and this is pretty much what our profession is all about. Worst experience? To be treated with no respect for our profession. Fortunately that doesn’t happen very often”. “I am sure a lot of artists would agree with me having experienced situation where you have been offered 3 sandwiches and some crisps over 8 hours working day or being offered a toilette as a changing room”. “As we are a themed act we are pretty much focused on new music and dance coming from Brazil and Latin America in general. Then we try to create a mixed production Show with artistic trendy element from Europe and America”. “It’s impossible to mention all the other entertainers we admire the most! Any way, we really admire the old school artists, those who even after decades are still there going strong and have created a trademark in the industry”. “This unpredictability does affect your family and social life though and as everything else in life it will end up to make a compromise where you can give and take according to your work commitments. Although the Musician’s Union is doing its best to regulate and control the industry wage for artists of any field (particularly West End, Teachers and Opera Ballet) still out there is a jungle and most of the time rules are ignored, partially or not applied at all, especially when it comes down to corporate”. “It would be a benefit for everybody to create a minimum, decent wage/rider for artists performing at corporate, Clubs, Pubs, LIVE music venues etc. At present the market doesn’t have such regulation which, from our point of view, is wrong”. “We currently are working on a new show for the 2014 featuring new choreography and costumes the band is also expanding the repertoire with new songs re-arranged with a Brazilian and/or Latin twist”. It is with great pleasure I write this testimonial for Tropicalia Latin Brazilian Show. 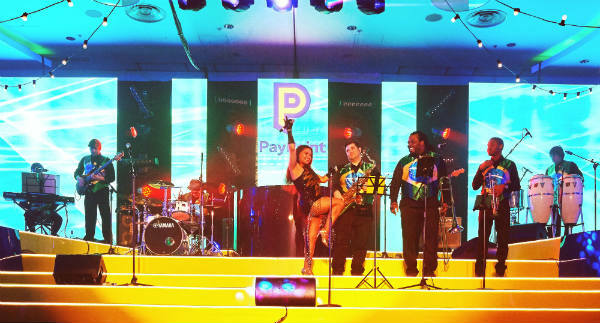 In Q4 of 2012 we contacted various agencies for a Brazilian Band and dance troupe to perform in Doha, Qatar. After careful analysis we had chosen Tropicalia purely for their past credentials and testimonials. I personally found Leo, Co-founder of Tropicalia and the whole Production Team very easy to work with, creative, extremely helpful and always going out of the their way to further enhance the production. The event in Qatar was extremely unique, with Royal family as guests, ministers and other dignitaries, attending the evening programme, all for SDC 8th Charity Gala Dinner. Tropicalia was able to choreograph a specially produced dance to adhere to cultural sensitivities within the Middle East region, which I found outstanding and very accommodating. The finale of the evening composed of an 11 piece band and 16 person dance troupe to close the evening and bid our guests farewell. I would very much recommend Tropicalia as an entertainment highlight for any event. 2016:The best Carnival dancers that we have ever had! They were absolutely stunning and got the party started. You have been a real pleasure to work with. I will definitely think of you for future events. They were fab! So great with the kids who all loved them, very flexible [literally and figuratively] able to fit into our ever changing schedule and a really lovely bunch. Please Leo, pass on our thanks to everyone who took part yesterday – the drummer and dancers were brilliant – and in the morning meeting everyone said how much they liked them! The dancers were fabulous! So accommodating and they gave a great atmosphere around the shop. Had some lovely feedback too! Thank you! We had booked the show for a corporate event and everyone loved it. Leo and the girls are highly professional, Beautiful, charming and very lovely to deal with. I hope we can book them again in the future! Thanks again for the great show and lovely presence. Tropicalia – absolutely fantastic! Leo, the band leader, is lovely, incredibly professional and very helpful, he did everything we asked and the whole band and dancers gave our 700 guests the party they were looking for! Superb music, amazing costumes and endless energy! I can honestly say they were very well worth the fee and I’d highly recommend them to anyone wanting a slick – but enormous fun – band. We had an amazing night, really enjoyed the Brazilian dance show. The dancers certainly made the party and got everybody in the mood. Friendly, personable and professional – exactly what I was looking for.